Clean Things Up: If you haven’t already, it’s time to get to work and make your farmland look nice and neat. Before selling rural property, you want to trim the grass, burn brush piles, trim trees, cut back limbs, trim fence lines, clear porches and more. A well-kept farm will be more attractive to prospective buyers. Highlight the Water: You can’t create water where there is none, but if you’re fortunate enough to have it, make sure it’s highlighted for your prospective buyers. Do your best to make your water visible from a distance by cutting back any growth that may block it. And make sure your buyers are able to walk right up to the water, too, which may include creating a path or trimming around the water itself. Plant Where You Can Plant: Don’t leave any areas of fresh ground or open dirt without something planted. 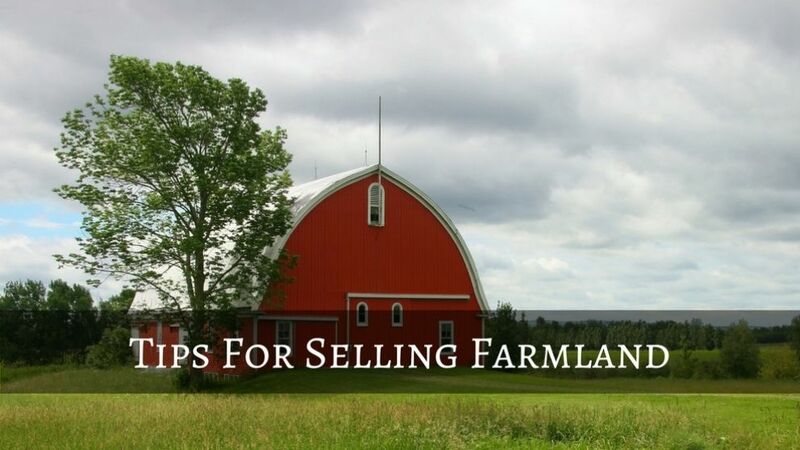 A farmland is about rich soil ripe for planting, so make sure you’re creating that effect in your buyers’ minds. Park Your Vehicles: Make sure your vehicles are parked neatly and out of the way to provide a sense of order and calm at your farm. It doesn’t create the right vision in buyers’ minds if your vehicles are strewn haphazardly around the property. Mind Your Livestock: Do you have animals that could be a nuisance on your property? Make sure they are put safely in a pen or in a part of your farm where they cannot be a distraction as prospective buyers tour the property. Don’t Forget Inside: Inside, the farmhouse should be treated just like a home in a traditional sale. You’ll want to stage for maximum impact, clean up, clear away clutter and more. Explore an Auction: When you’re wondering how to sell farmland, consider an auction. An auction can help a property sell quickly, and it can also involve less in fees and associated costs — which means you stand a better chance of getting the best possible return on your property. Could you use some farm auction tips? At Fortna Auctioneers, we are your experts on how to sell a farm using the auction approach. We can walk you through the auction process and let you know what kinds of benefits you can enjoy when choosing an auction over a traditional sale. Contact us today about farm auction tips and getting the best results when selling rural property.